As we turn the page on a new calendar year there’s much to be excited about, especially when it comes to our first exhibitions of 2014. 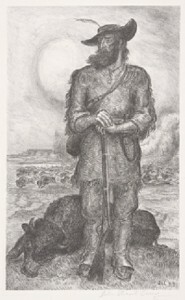 John Steuart Curry (1897-1946), The Plainsman, 1945, lithograph on paper. Featuring a small selection of the approximately 900 Curry works in the Beach Museum’s collection, this exhibition presents a range of images depicting the Great Plains including pioneer settlement, American Indian movement, and the struggles between Civil War-era abolitionists and pro-slavery forces. Tom Parish, T. Candon Root Cellar, 2013, inkjet print on paper. Parish, a Manhattan, Kansas-based artist and K-State graduate, spent two years documenting native stone cellars in the Flint Hills. This multi-media installation, funded in part by the Kansas Humanities Council, includes 360-degree large scale photographs of the cellars, maps, audio recordings, and written text. 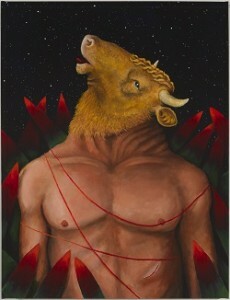 Paul Sierra, Asterión, 2009, oil on canvas. Jorge Luis Borges is one of Latin America’s most celebrated literary figures. Philosophy and visual art intersect in this exhibition as twelve of Borges’ most famous stories about identity and memory, faith and divinity, and freedom and destiny are represented by Cuban and Argentinean artists. And don’t miss the reading room adjacent to the exhibition featuring books and other unique materials related to Borges’ work, presented in partnership with K-State Libraries. Be sure to check out our calendar for upcoming programs and events related to these exhibitions. We hope to see you soon!